Patrice (Taenaka) Noteware, Class of ’72, made her way to Uni for a visit as she prepares for her 50threunion. She stopped into the library, and I had a chance to interview her about her time at Uni. She is not short on happy memories from her days here “It was a glorious time of life,” she recalls. Patrice was active in campus clubs, serving her Warrior community and taking advantage of the many offerings at Uni. She was elected chairman of the Friendship Board and was Girls’ League Vice President. To raise money and school spirit, she had fun selling pickles on the Walkway and Valentine candy-grams. She served on the yearbook committee with Mr. Citrin –who she said did most of the work but gave them all the credit. As the district moved away from semi-annual promotion to annual promotion, Patrice’s class was able to choose either to advance a semester and graduate early or return the following year and take an extra semester. “What’s the hurry?” she remembers her mom asking her. So she decided to stay on and was able to complete two semesters of ceramics, pursue painting and drawing, and her finish her fourth year of French with Mr. Libenson. She fondly remembers practicing her French with friend Usha Viswanathan (’71) in Mrs. Rennick’s home economics bungalow during lunch. She also passed the test to take classes at UCLA and went there to take Japanese in the afternoons with fellow Warrior, Marianne Yamaguchi. Not surprisingly, she was awarded the Foreign Language department’s trophy in her senior year. She more than held her own among the “whiz kids” like Robert Reznick (a fellow recipient of the Bank of America Award), and Lindsay Connor whose quick minds impressed her in Mrs. Jorgenson’s AP English class. Her studies at Uni helped shape her future, as she ultimately majored in linguistics at UCLA, setting her up to attend Cal State Northridge’s top ten graduate program in Communicative Disorders. Subsequently, she returned to LAUSD to serve a broader community of students in the city for almost thirty years. Interestingly, her time at Uni not only prepared her for the future, it also helped her to understand the past. Like many lucky alumni, Patrice took American history with Mr. Berntson in her junior year. Throughout her life, her mother had been complaining about her experiences in Manzanar. As a young person, all of this seemed like so much talk about something that was in the distant past, an experience that would be difficult for any youth to confront as being part of a parent’s past. 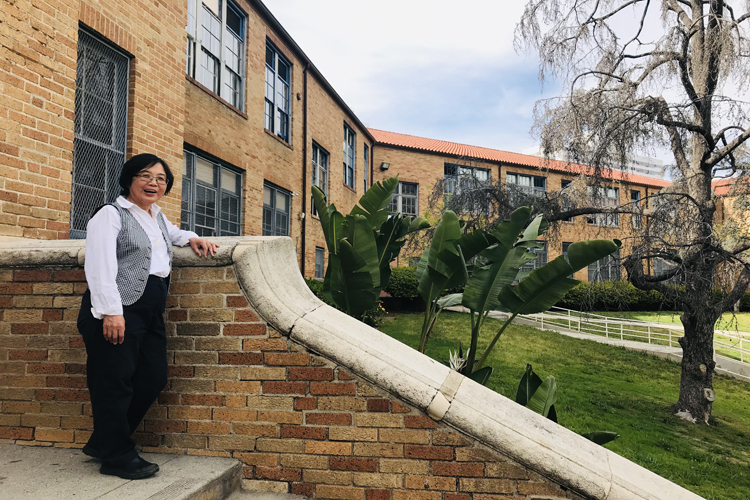 Mr. Berntson’s engaging class provided her with an opportunity to do a term paper on a subject of her choosing, so she decided to delve into her mother’s experience at Manzanar. Through her research, she began to get a better picture– quite literally through Ansel Adams’ photos of the time period– of what her mother’s family had faced. Patrice’s mother, Ann Eayo (Tanaka) Taenaka , was the second of four daughters. Before the war, her mother, her mother’s older sister Nobu, and her mother’s younger sister Atsu, had attended Hollywood High School. Atsu had just been accepted to UCLA when the evacuation orders came and was forced to give up that opportunity and travel instead with her family to Manzanar near the town of Independence, California along Highway 395. Their youngest sister, Miyo Tanaka, was enrolled at Uni at this time. Miyo is listed in our alumni directory as having graduated from Uni with the class of 1945. In actuality, she was denied the opportunity to finish at Uni and instead completed her coursework while she was interned in Manzanar. Her mother was just twenty years old when she arrived there. The women of the family were separated from their patriarch, Patrice’s grandfather, who owned two nurseries in the Los Angeles area before the war. Her grandfather, having served in the Japanese Army as a young man in Japan, was now considered a suspect by the FBI for having fulfilled his duty to his native country decades earlier. With his name on the list of people the FBI considered to be community leaders, he was rounded up along with the other men in the community the night the bombing occurred. Along with those other men in the same situation, he served separately from his family, leaving his wife and his four daughters to run the family business until they too were sent away. Some members of her family were released earlier than others. After the United States’ victory at the Battle of Midway, many young people were permitted to move east. During that period, Atsu, who had been unable to attend UCLA, attended a six-week training and became a hairdresser and helped Nobu attend college where she got her degree in art. Patrice’s grandfather was forced to remain interned all the way until the end of the war. Her family were of determined stock. They returned to Los Angeles only to find themselves at the mercy of yet another shameful government policy, Redlining, which made it nearly impossible for people of color to purchase a home. But her family were smart and found a way around this; they bought an empty lot and began building on it themselves. Despite these painful and unjust experiences, they returned from the camps and made prosperous lives for themselves. Patrice’s Aunt Miyo had become an excellent seamstress at Manzanar, and in the years going forward was able to design an exquisite wardrobe for her own mother, who was only 4’6” and could not find fashions her size in department stores. Miyo and Atsu are still alive today and in their nineties. When you talk to Patrice, you feel the inextinguishable can-do attitude that propelled this family forward. She has used this determination both to work hard and enjoy life, and her twenty-two-year-old son reflects her hard work and quest for fun. Prior to graduating from Cal Poly San Luis Obispo, he was able to travel to Barcelona to complete his units there and is currently deciding between several acceptance offers to civil engineering programs. She looks forward to reconnecting to everyone at the reunion in a few years. At Uni, Patrice had her chance to pursue the promise of the American dream, and she remembers fondly all the people who took that journey with her. She has more interesting news about the next chapter of her life, but she is hoping to share that, other latest news, and happy memories at the next reunion. If you are a member of her class and interested in helping her plan for 2022, email Patrice at ptnoteware@yahoo.com.